Knowing how to teach a puppy to lie down on command is one of the most useful tools in the dog owner’s arsenal. Learn how to teach a puppy to lie down on command. In the beginning of any training session, you want to stock your pocket or pouch with treats and go to an area where the dog is comfortable with no distractions. It may be easier to train your dog if he is connected to a leash. The most important thing to remember when teaching the down command to a puppy is to not force the puppy into the position. Putting your hands on him could cause him to become aggressive, it encourages distrust and it may lead him to resist future training. The easiest way to teach “lay down” on cue is to food-lure the dog from a sit position. Bait your hand and ask your pet to sit. 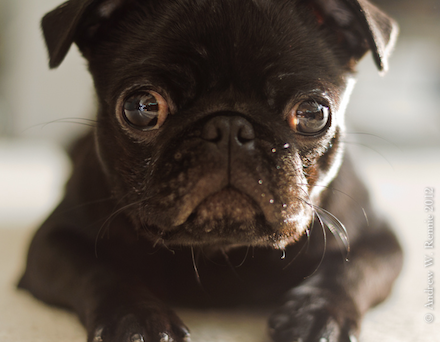 Place your baited hand about 1 inch above the dog’s nose and encourage him to touch it. While the dog’s nose is stuck to your hand, begin moving your hand down toward the ground. It’s good to aim your baited hand about 2 inches in front of his feet. His nose should be attached to your hand the entire time. If the dog gets up or the nose leaves your hand, say “Nope” or “Eh-eh” and stand up quickly to take the treat out of the dog’s reach. This removes the dog’s chances of getting a reward and acts as a punishment. If his nose falls away from your hand many times, work on this more. Once you have successfully lured the dog’s nose to the ground, begin very slowly moving your hand along the ground away from the dog until he lies down. The dog is considered down when his rear end and elbows touch the ground. Your hand in this exercise should resemble an “L” shape. The instant his elbows touch the ground, praise and put several treats on the ground between his front paws. It’s very important to put many treats on the ground to prevent the dog from getting up quickly while also orienting him to the ground. Before he gets up, give the release cue and praise heavily. You can lure the dog under your knee to get him into the down. Sit on the floor with your knee bent to make a low bridge and move the very desirable food under your leg so the dog has to crawl under your leg to get the treat. Once his elbows and rear end touch the ground, praise heavily and offer the reward. Also, you can capture the dog’s behavior when he is lying down in a natural setting. If you “catch” him lying down, praise him and offer treats to show him that it is a desirable position. If your pet is hesitant, resistant or seems unsure about lying down while luring, you may need to reward the slightest effort the dog makes in the right direction. In this case, you can have the dog nibble or lick the treat in your hand while you are luring him down or under your leg. 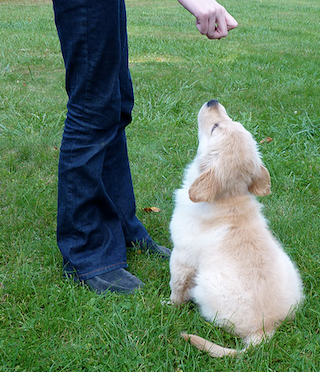 To encourage improved responses, each time you train your dog, delay offering the treat for him to nibble at until he goes farther into the down position. Once the dog goes easily into a down position, offers the focus cue and waits to be released, you should begin to fade out the lure. Begin to give the verbal down command before the lure and offer any rewards once the dog is completely down. After doing this several times, the he will begin to anticipate the lure into the down position once the verbal down command has been said. When you see the dog is anticipating the down command, stop doing the lure and just say, “Down.” Wait a few seconds for the dog to think about what to do next. If he does not go down, offer the lure to help him out and try again. When the dog is going into the down position without any help, start to offer better treats for faster responses to improve performance. Although learning how to teach a puppy to lie down on cue can sometimes be difficult, it’s a very useful command to teach. Whether your pet takes to the command quickly or needs extra help, it’s important to stay patient and positive when training a puppy.